If the words engineering and excitement strike you as an oxymoron, then you haven't heard about these jobs. From playing with toys to helping create movie blockbusters to exploring space, the jobs described below are anything but boring. Kind of makes you wonder why everyone doesn't pursue a career in engineering. Though we beg for them as a child, toys might not come to mind when you think of engineering careers. Except if you're someone like Shannon Bruzelius. He was your typical Toys-R-Us kid, playing with everything from action figures to train sets. "I always thought it would be cool to work for a toy company." But Bruzelius didn't begin his career by following this dream. Instead, he took the well-traveled road of many mechanical engineers and accepted a position with a utility company located in Colorado, all the while wondering if he could use his engineering skills to pursue a career with a toy manufacturer. After a year, Bruzelius decided to stop wondering and find out. He resigned from the utility company, packed his bags and moved to the toy-company hub of Northern California. "I hadn't talked with anyone there before moving, but at least I would be in a place where I could be in contact with [toy companies]," he says. Once there, Bruzelius worked odd engineering jobs during the day and sent resumes to area toy companies at night. He arranged as many informational interviews as he could, hoping to gain insight into the toy industry, while putting his name and face before people who could make a difference in his job search. Eventually, his hard work paid off when he met with an engineer from Wild Planet Toys. "We talked for a few hours, and I asked a ton of questions," he explains. "I guess he liked me enough to keep my name on file, because six months later he asked me to interview for a [position]." 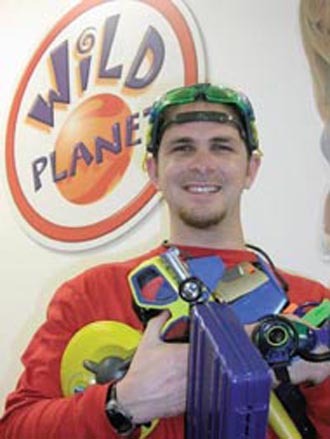 Today, Bruzelius is surrounded by toys as a project engineer at Wild Planet Toys in San Francisco, where he's worked since 1999. Getting paid to play may sound too good to be true, but that's an integral part of Bruzelius' job description. Like other engineers who test new product designs, Bruzelius has to make sure that the toys do what they are designed to do, which just happens to require that he play with them. "I keep a pair of swim trunks in my desk, because you never know when you have to go test a water toy," he says. 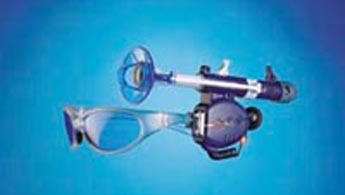 In addition to a full line of pool toys, such as underwater radios, Wild Planet produces an array of spy gear, including sunglasses with hidden cameras and secret messengers. "There are days when we go wandering the streets of San Francisco testing walkie-talkies," Bruzelius says. Much of the engineering work, such as the toy's electronics, is done at the company's operational sites in Southeast Asia. So much of his time is devoted to project management, rather than design work. "Still it's important to have the [technical] background because you make your decisions based on engineering knowledge." That background should include a knowledge of materials, particularly plastics. "When it comes to plastics, you have to know about the thickness, material characteristics and failure analysis. You also have to know about molding and the processes involved in making the parts," Bruzelius explains. And like other industries in the business of manufacturing products for the public, production costs and safety are always concerns. "You may be able to make a toy cheaply, but how safe is it? Sometimes we just can't do a design because of the cost or a safety issue." A few years ago, the toy market experienced a significant downturn. While the industry has since rebounded, it's still susceptible to market swings, especially when retail is hit hard. Overall, Bruzelius says it tends to be a fairly consistent industry. Toy companies may not hire large numbers of engineers or computer scientists each year, but there are career opportunities. If getting paid to play with toys appeals to you, Bruzelius recommends you get to know as much about the toy-making world as possible by joining industry groups or subscribing to trade journals. These will keep you informed of industry happenings, as well as introduce you to names of people who are making significant moves. A well-developed network is key both in the job search and on the job. "As an engineer you don't have to know everything, but you do have to know where to find it. If you're trying to find glow-in-the-dark ink, then you have to be able to know where to get the information." Although he loves every step along the toy-making process, the best part of Bruzelius' job is seeing the product on the shelves. "There's nothing cooler than hearing a kid or mom say, 'I love that. It's so cool.' That's my toy and I know the magic behind it." It's often the magic of how or why something works that entices people into engineering and computer science. For Mike Earnest, a native Californian, that magic came in wanting to understand how Disneyland blended technology and art. "I virtually grew up in Disneyland and my first experience with a robot was seeing Abraham Lincoln [in the park's 'Great Moments With Mr. Lincoln']," he explains. "That was when I realized there was an entertainment aspect to robots." 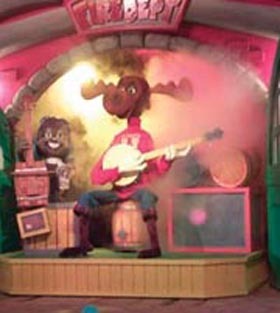 An animatronic Bullwinkle created by Mike Earnest. Photo courtesy of Dreamation, Inc. But what sealed the deal was seeing the movie Star Wars as a teenager. Earnest and his brother immediately set out to create their own R2-D2, which was eventually used in a science-fiction adaptation of Romeo and Juliet for his high school play. That's when he knew he wanted to work in entertainment animatronics. Rather than pursuing an electrical or mechanical engineering degree in route to his dream job, he chose a theater arts program. "I found out that John Dykstra, the man who made the aircraft fly in Star Wars, had gone through a theater arts program, so that's where I decided to go." But he also knew that to be a marketable graduate he needed to gain experience in as many aspects of special effects as possible, so he built a background in electronics, machining, welding and architecture through classes and working on college theater productions. Mike Earnest. Photo courtesy of Dreamation, Inc.
That background eventually led to his first job: building Chuck E. Cheese restaurant stage creatures in the early '80s. From there, Earnest became a mechanical designer at a Southern California toy company, achieving success with the creation of the Teddy Ruxpin doll - among the first mass-marketed animatronic toys. After a brief stint as a production manager at a children's video production studio, Earnest finally decided to pursue his interest in animatronics. 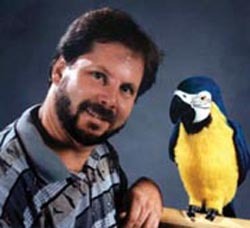 In 1988, he established Dreamation Inc. in Yucca Valley, California. "I started by developing prototype products for other companies, such as Mattel. These included everything from plush to hard toys to specialty items," he says. "Then the work evolved to include amusement parks, such as Disneyland and Bullwinkles, and casinos like MGM Grand. We build animatronics for their large stage shows." Depending on the size of a job, it can take between 30 days and six months to design and build an animatronic creature. The tight deadlines, however, can be the most challenging aspect of the work, notes Earnest. "We're artisans at heart, and sometimes we don't want to give up our work. I guess you could say we're perfectionists." Although the Dreamation staff handles most of its own projects, Earnest often brings in engineering consultants for the larger, more complicated jobs, making use of their expertise to problem solve structural or electrical questions. But for those engineers who are seriously interested in making animatronics a career choice, the best advice, says Earnest, is to always be curious. "If you're an engineer who likes to build or run machines then you have a much better opportunity of working in the industry." Earnest also recommends building a broad background, which might include taking a seasonal job at a local amusement park, even if it's not directly attached with the animatronics attractions. "Whenever you have the opportunity, ask the technical staff to give you a tour," Earnest says. "Most people will be happy to show you backstage or to answer questions. From this, you're building relationships with people who are working with the technology." Creating moving creatures for parades, stage shows and amusement parks obviously isn't a blue-chip industry. It's highly specialized and contained, dependent on the economic fortune of its client base. If attendance at parks drops significantly one year, then budgets for new attractions the following year are cut. 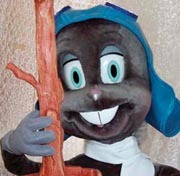 Additionally, the animatronic industry is highly competitive, especially now that feature filmmaking has become heavily dependent on computer-generated images. That's why Earnest is always looking for new applications of the technology. Rocky. Photo courtesy of Dreamation, Inc.
"There are some broad opportunities for this type of work, from costumes to fiberglass work," he says. "For instance, 15 years ago I wouldn't have gone to a toy company, but I probably would today." Still a big fan of Disneyland, Earnest now views the park's larger-than-life attractions with a different sense of appreciation. "It's great to know people have seen the things I work on and enjoy them." Thanks to Lucas Digital and its entities Industrial Light & Magic (ILM) and Skywalker Sound, based out of San Rafael, Calif., the way movies are made, viewed and heard has changed. Episode II: Attack of the Clones, for example, was filmed entirely with digital cameras. This allowed the production crew to skip the tedious steps of converting film to digital images in order to add in computer-generated images. Computer scientists received the digital images directly from the set or location shoot and immediately set to work with their computer graphics. Among the staff was Max Chen, a junior software engineer at ILM, who specializes in 3-D coding. A longtime Star Wars fan, Chen says he was intrigued with the ever-advancing capabilities of graphics technology. So much so that it was the focus of his graduate work at MIT where he graduated last year with a master's degree in computer science. After two years of researching the technology, he decided to pursue a career with the industry leader. "ILM is at the forefront. It's always incorporating new techniques and research into how to make things faster. It's pushing the edge of technology," he says. Of course, Chen could have successfully taken his knowledge and experience to the video or computer game industry or Web services, but he preferred film. "It's much more visual and that's interesting to me. Also, I have an [undergraduate] degree in architecture, and I wanted to stay within that artistic realm," he says. Fortunately, his job search paid off. After being hired in July 2001, he quickly found himself immersed in the production of Episode II. Chen stepped right in to work on ILM's motion and structure recovery system. "The program allows us to take images in a scene and determine where the motion is taking place," he explains. "Using computer algorithms, we can match the movement and recover it in a 3-D information process. It's cool - you're coding an object in 3-D, and you see something visual instead of just numbers." Chen says the procedure can be used to either enhance an item, like adding facial expressions, or cleaning up an object that may be slightly out of focus. "It's mostly done on live-action images, but we do insert computer-generated images into [the scene] and then composite it altogether," he adds. Even though Chen and his colleagues work in the rolling hills of Northern California, the intense pressure and competition of Hollywood are never too far off. The film industry has come to rely on the audience appeal of special effects as seen in The Matrix, Spider-Man and Men in Black, to name just a few. Although the digital images of Episode II ultimately were transferred to film so it could be shown in theaters worldwide - there are only about 60 movie houses in the United States and Canada equipped to show the digital version - many industry experts see this as the format of the future. Logically, this dependence on technology will create more opportunities for computer scientists. 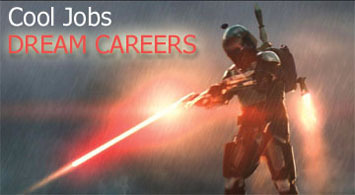 But with a similarly growing interest in special effects careers, competition for jobs will most likely remain high. "There are a lot of people wanting to do the work," says Chen. "I would say that you need an advanced degree to get an edge in the market." Specifically, he recommends getting involved in graphics research even as an undergraduate. Not only does it demonstrate a knowledge of the industry, it also shows an initiative to keep abreast of the ongoing advancements. "Find out what's being published and how it's being built." Although filming on Episode III isn't scheduled to begin until next spring, Chen is hard at work on other films, including The Incredible Hulk. No matter the subject, Chen remains captivated with the work. "Plus, I get to see a lot of movies." Of course, space travel isn't limited to a filmmaker's imagination. For more than 40 years, man has been exploring the possibilities of space, including the probability of life on other planets. 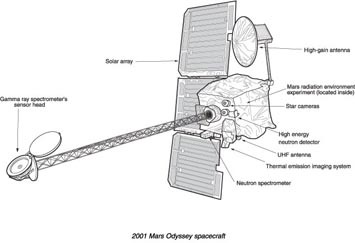 One such person is David Spencer who is leading the 2001 Mars Odyssey mission in hopes of broadening our knowledge of the Red Planet. Spencer's attraction to space exploration was first captured in high school when he read James Michener's Space. "That book got me interested in space exploration and made me want to become an astronaut." But unlike other young people who had the same dream, Spencer actually set out to attain it. In college, however, his career objective changed when he was introduced to orbital mechanics and interplanetary trajectory. The thought of sending unmanned crafts into the galaxies on interplanetary exploration intrigued him. "I tailored my undergraduate and master's work into trajectory design," he notes. From there, Spencer headed directly to NASA's Jet Propulsion Laboratory in Pasadena, Calif., one of the nation's premier space research facilities. 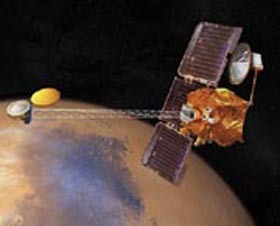 Within a few years, Spencer found himself assigned to the 2001 Mars Odyssey project as mission manager, a very pivotal role. To oversee a project of this magnitude, with such potential for historical and scientific significance, is quite an accomplishment for a barely 30-something professional. "I never thought I would have such a cool job at that age," he says. As mission manager, it's Spencer's responsibility to oversee every aspect of the Odyssey project. "There are millions of details, parameters and numbers that have to be examined before we can send a craft to another planet," he states. And many of these steps can take years. "It takes at least three or four years before you even launch the spacecraft. Then it takes time to get the craft to the destination and then more time to get the data from it," Spencer explains. 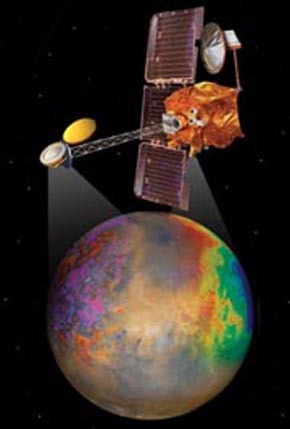 But that's exactly what's been happening since 1997.In April 2001, the Odyssey was launched and within a year was in Mars' orbit mapping its surface in search of chemical elements and minerals. Of course, there were setbacks along the way. "You can be on the verge of achieving great success and something terrible goes wrong," Spencer says. "Those are the difficult parts of the job, but the rewards are outstanding." Spencer and his team recently received one of those rewards. In May, JPL announced that the Odyssey had successfully launched a boom that relayed back some very revealing information: There is indeed water on Mars. The probe detected a thick layer of ice just a few feet below the surface. This discovery brings scientists one step closer to determining when or whether the planet ever supported life. "Once the spacecraft starts sending back images of something no one else has ever seen, it's amazing," says Spencer. The Mars Odyssey work is good news for the space agency, which has faced budget cuts in its International Space Station endeavors. But Spencer foresees a bright future for his program. "Our understanding of space and other planets is in its infancy," he says. "For example, we know that Jupiter's moon Uropa has a great deal of ice on its surface. It may be miles thick or a salt ocean. We have no idea what's inside it, but I do believe these questions will be answered in the next several decades." In order to explore those mysteries further, NASA must continue to attract aerospace's finest engineers and computer scientists. "We want someone who sees not just the surface of things, but who digs into details. We want someone who wants to discover what's going on," Spencer says. Of course, interest alone won't secure a job at JPL. Success in a specialized industry often demands advanced training. Like Chen, Spencer agrees that at least a master's degree is required. But even then, use your passion for a specific subject to create a unique graduate education. "We always need skilled people who can build a background that sets them apart," says Spencer. In the five years since he began working on the 2001 Mars Odyssey project, Spencer has reviewed hundreds of details along the way. But it's the same interest Michener's writings piqued that keep the work exciting. "It's easy to lose the romanticism, but when you see an image from Mars, you get a sense that space exploration is possible. I would be disappointed if I'm 85 years old and mankind has not yet stepped foot on Mars." For engineers, turning your hobbies and childhood passions into a successful career is much more than a pipe dream, even in today's unpredictable economy. As these engineers and computer scientists have proven, pursuing a job that's out of the norm can be your ticket to a long and satisfying professional life. Anne Baye Ericksen is a free-lance writer who specializes in career development.